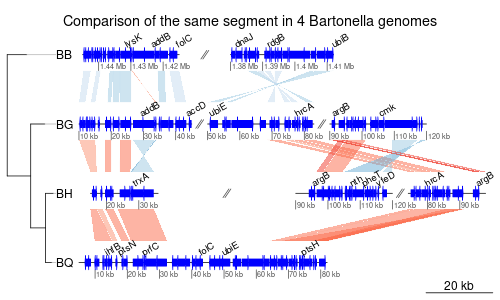 Welcome to genoPlotR - plot gene and genome maps project! The project summary page contains all info on downloading, obtaining help, reporting bugs and proposing features. There are some screenshots available, and a pdf with all the graphics from the examples. A vignette and the manual are also available. Be sure to check plot_gene_map and the reading functions first. and affects the example data (which has "col"). folder on R-forge. Package back on CRAN. to anything. Added check for that. comparisons with 0 rows to crash the program. - Extra fields (tags) can be parsed from genbank and embl files. - Added a function, artemisColors(), that returns the colors as in Artemis. - Added experimental support for tree branches annotations. - Modified the feature parsing algorithm, features with an "_" inside (ex. Article published in Bioinformatics, added a CITATION file. placement of the whole segment. big trees (requiring more than 1000 permutations) broke the program. time of plotting (and not when parsing comparisons).